It’s that time again – ASOS have 25% off for students! I always get quite overwhelmed by the sheer amount of stuff there is on ASOS, so I have thrown together a little wishlist to inspire you if you want to take advantage of the discount but don’t know where to start. Vagabond Erie Sliders – ‘sliders’ were my first port of call when I started to browse ASOS this morning – it hasn’t been warm enough for me to bare my toes just yet, but I’ll definitely be picking up a pair of the super on trend sandals before summer comes. This pair by Vagabond are my favourites so far, they are quite steep at £55, but maybe now is the time to snap them up at a much more reasonable £41.25? New Look Flux Cleated Sole Sandals – more sandals; this pair from New Look are fab and are only £19.99 to begin with. I don’ think these quite fall into the ‘sliders’ category but they’re a great, versatile sandal which would go with almost any outfit. ASOS Strappy Crop Top With Wrap Front – cute little top to throw on under an overshirt or wear by itself for a summer evening out. New Look Gingham Shirt – gingham is everywhere at the moment, but most of my gingham prints are on mega girly silhouettes, for example floaty dresses and skirts. I’m going to buy this shirt to mix it up a bit! Vans Sk8 Hi – my black and white Vans Sk8 His are probably my most worn shoes, so I’m extremely tempted to pick up this all white pair for the summer months! ASOS Rescue Me Ankle Boots – how amazing are these?! I struggle to wean myself off ankle boots when the weather warms up, so a pastel pair with cut out detailing would be the perfect solution – swap your black ankle boots out for these for an instant summer outfit update. ASOS Western Tip Waist Belt – there’s no particular reason for including this belt here, other than I could do with a new one and I like the larger silver buckle and ‘Western’ style detailing of this one. theBalm Luminizer – don’t forget that ASOS stocks a massive range of beauty brands too; I’ve heard great things about this highlighter and really want to try it out. ASOS High Shine Rain Mac – with festival season approaching I’ve seen many wistful wishlists of tiny denim shorts and crochet vests, but realistically it’s probably better to invest in an adorable waterproof like this one. ASOS Fluffy Cocoon Coat – is it too close to summer to be buying coats? Nahh, not if they look like this one anyway! ASOS Felt Fedora – a fedora finishes off any outfit perfectly, and I love that this one comes in lilac! I could go on and on; I also love this duster coat, this satin slip dress, these crepe cigarette trousers, this heart print midi skirt, and this crochet fringed kimono. Happy shopping! PS: today is the LAST DAY you can nominate in the Company Blogger Awards 2014. I would be eternally grateful if, if you like my blog, you could take 30 seconds to click here and nominate me for Best Personal Style Blog. Thank you so much to everyone who has already nominated, and do leave me a comment to let me know if you have! This is a great wishlist, Asos has some beautiful stuff on at the moment, and you really don't wanna be missing out on the 25% off offer! 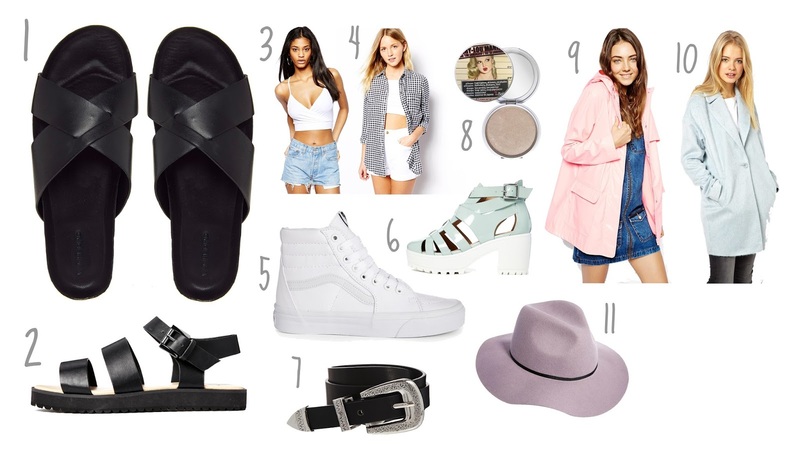 Check out my recent wishlist that also features Asos?